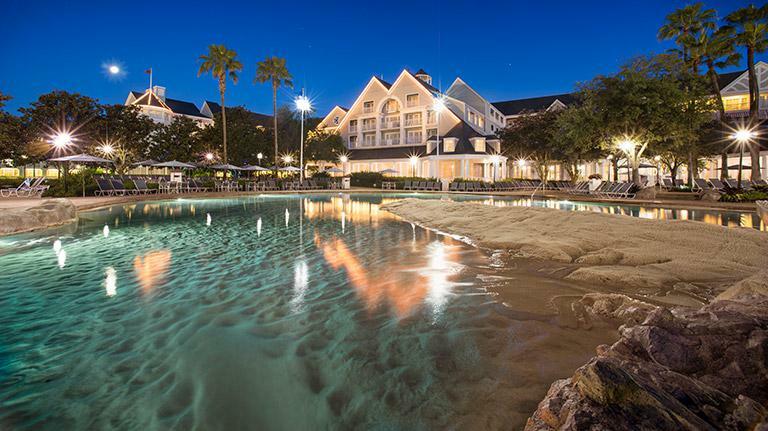 Splish splash, sunny summer weather makes Walt Disney World® Resort vacations a blast for Guests of all ages! 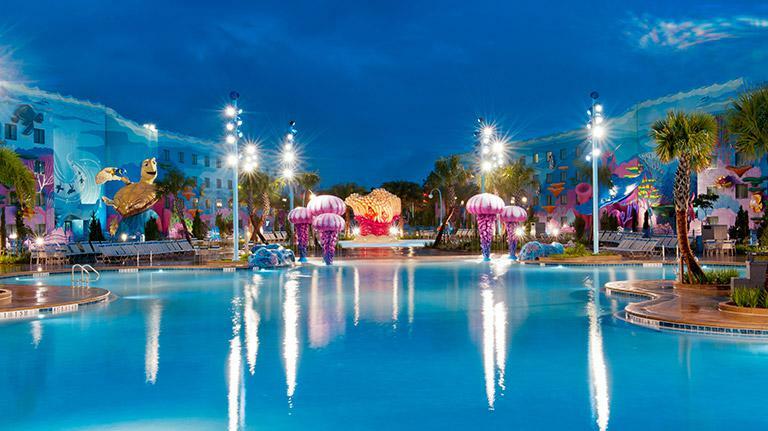 The pools at Walt Disney World® Resort are more than just kid-friendly; they dive deep into scenic landscapes, Disney storytelling, and surprises along the way, making every swim an adventure. 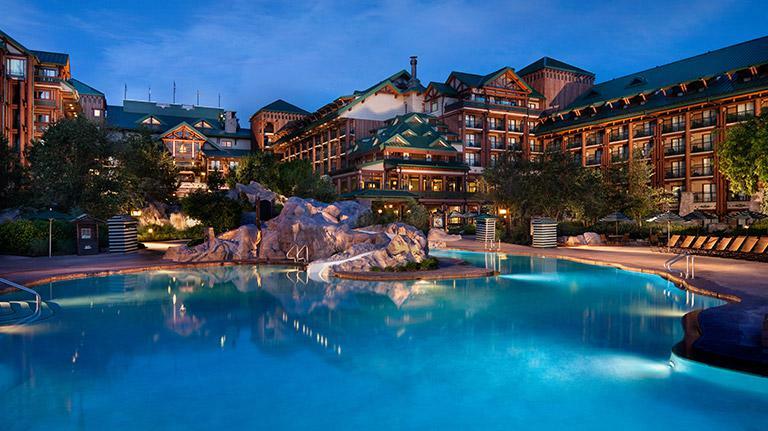 It’s hard to pick our favorite Disney pools for family fun when there are so many to choose from, but we’ve narrowed down our top 10 Walt Disney World® Resort swims to meet your whims. 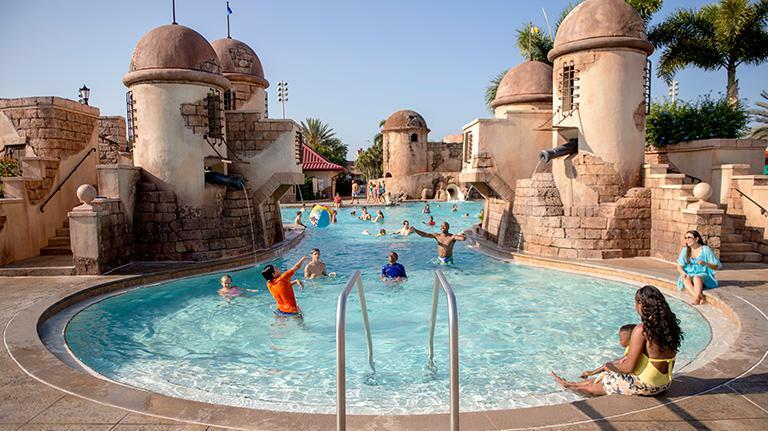 And while splashing your cares away, you can be planning on how to enjoy these extra-special Cardmember experiences and savings at the Parks. The only question now is, water you wading for? Music underwater? Whoa. Yup, the largest pool at Walt Disney World® Resort features underwater speakers playing favorite Disney tunes that’ll make you want to “just keep swimming!” Kids can take selfies next to the giant Finding Nemo characters surrounding the pool, get sprayed in Schoolyard Sprayground, and have a turtle-rific time in Squirt’s Righteous Reef. Ever swim in the woods? Nestled among pine trees and the rustic Boulder Ridge Villas reminiscent of 1860s railroad hotels, taking a dip in this pool is like swimming in a forest. 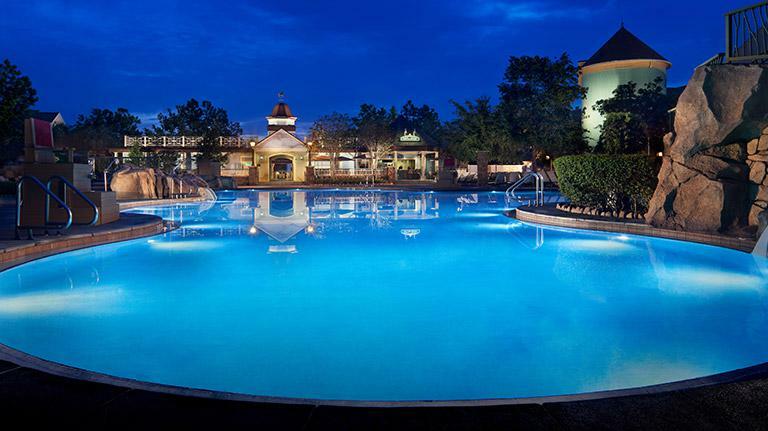 Keep the tranquility going as you soak in a whirlpool spa or relax in a secluded cabana. Adventurous swimmers will want to check out the Lost City of Cibola pool featuring a 50-foot pyramid with water streaming down its steps. 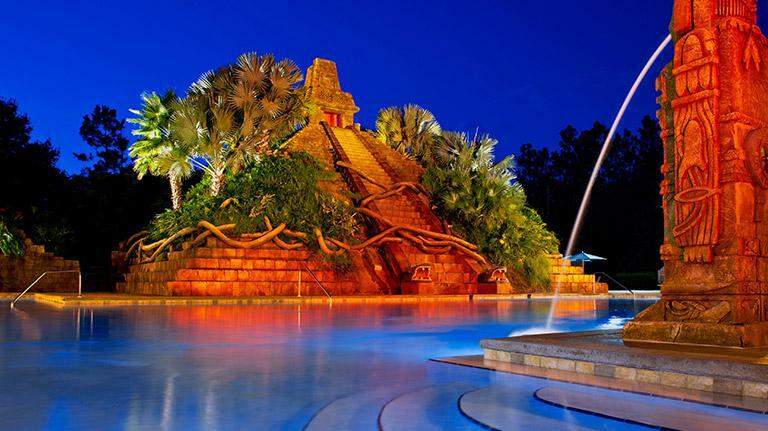 Or take a wild ride on the 123-foot-long waterslide – but watch out for the spitting Jaguar animal spirit! Welcome to a water wonderland! 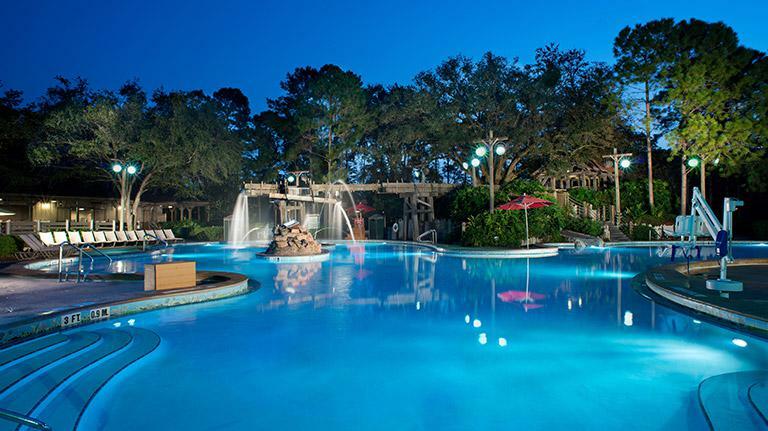 In addition to three relaxing whirlpool spas – the perfect pick-me-up for grownups — these three acres of aquatic fun feature a sand-bottomed pool, a life-size shipwreck replica, and a super high waterslide. Arrr, young buccaneers will get a kick out of this pirate’s paradise surrounded by an authentic-looking colonial Spanish fortress. 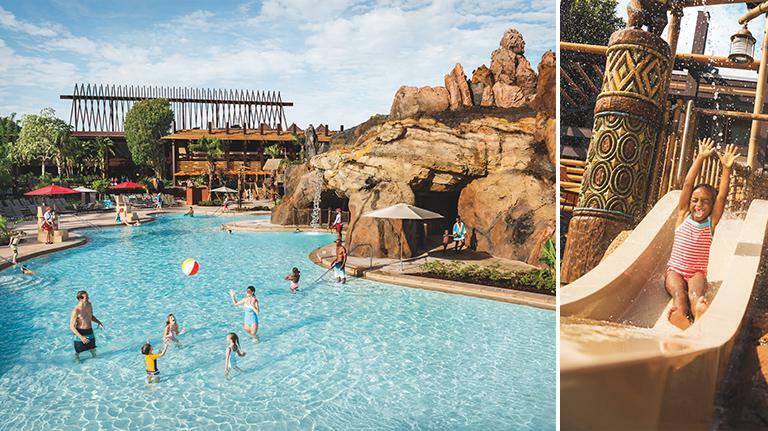 Take a ride on one of the two waterslides – don’t worry, the cannons only shoot water – and explore the shipwreck play area with mini slides, a crow’s nest, and a barrel of laughs that’ll drench you! Ride. Splash. Repeat. Settle in for the afternoon, because kids are going to want to ride the wild 67-foot waterslide again and again. Meanwhile, over in the not-so-splashy zone, the sloping entry point, similar to that of a natural beach, makes this tropical oasis pool perfect for tiny tykes just starting to get their feet wet. Channel your inner Tom Sawyer and take your kids out on a real adventure on this 3-acre island sporting an old-fashioned swimmin’ hole, a sawmill slide, and even an authentic catch-and-release fishin’ pond. 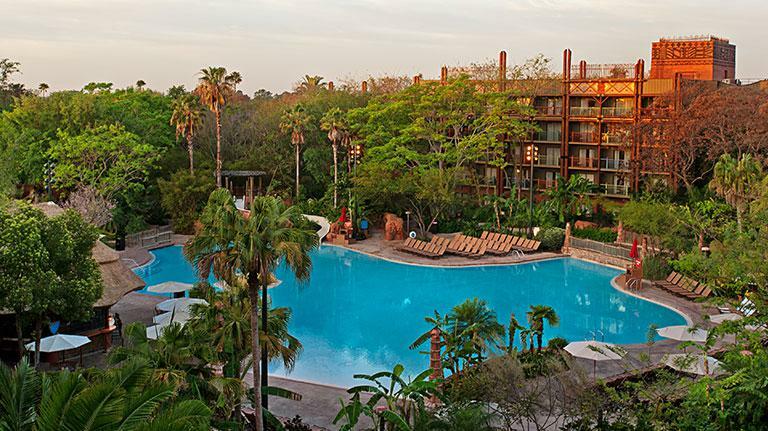 Your reward for climbing up the gigantic volcano, the centerpiece of this tropical-themed pool? A thrilling ride down a 142-foot-long waterslide! You’ll lava it! Get your leisure on in a secluded, soothing pool (with a whirlpool spa on the side) before retiring to your elevated three-bedroom lodge nestled amongst trees. Talk about a bird’s-eye view. Prepare to get wet! Unsuspecting visitors will get squirted, splashed and sprayed by sneaky African flowers, dragons, a leaky water tower, geysers, and more. 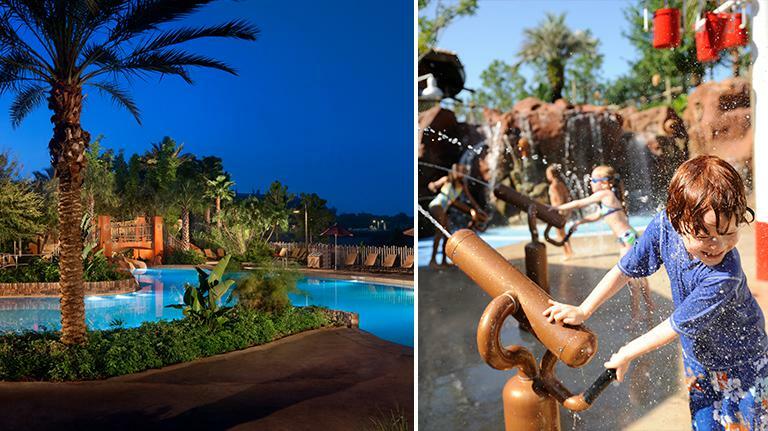 Three fun zones offer activities geared toward different age levels, so little ones can unscramble animal images while older kids can soak each other with water cannons.